Well in very un-Jessica like fashion, my birthday came & went without me making a huge to-do about it. Is this what 26 feels like? I don't know about that quite, but this IS what 26 looks like. In my 26 years I have learned that 3 of my favorite things are: blazers, tortoise & scallops. And on a girls' birthday she is certainly entitled to wear all three! What would your "birthday suit" look like? Love the dress; perfect color! Happy bday!! What a gorgeous dress! The color looks fab on you, and I adore the scalloped details! Love that scalloped hem and happy birthday! This post is a win based just on the title. Happy birthday! Lookin' good! Happy birthday Jessica! Love this dress - very J Crew like and I love it with the brown accents. Our blog titles are so similar today....I am talking about tortoise & leopards :) Enjoy your day! a mint scalloped dress? sign me up please. haha just kidding, I'm only 3 weeks younger. WE'RE SO OLD NOW. The scallop detailing and color of that dress is beautiful! what a cute dress! adore the cuff as well! happy birthday! Happy belated birthday! The scalloped hem is SO pretty! I did the same thing for my 26th birthday, weird! Loving the scallops on your dress, super cute detail. Happy birthday!! You look great with those colors mixed together. 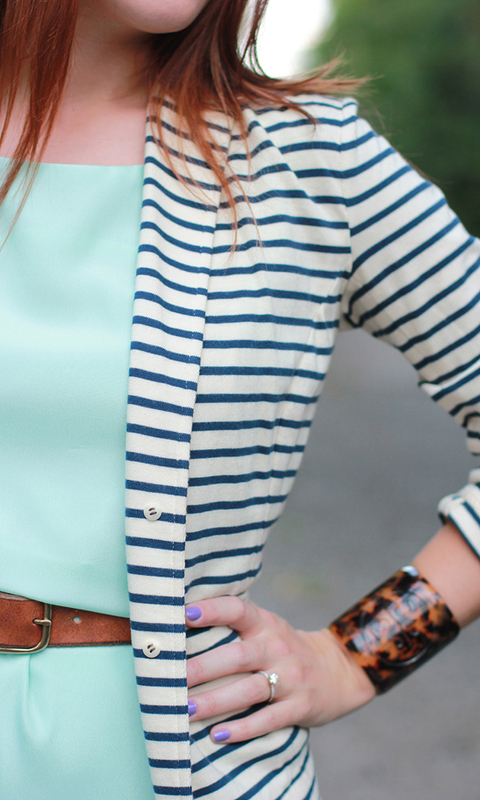 Love the striped and that amazing tortoise cuff! Love the scallops on your dress! That color is really pretty too! HAPPY belated BIRTHDAY!!! What a beautiful outfit to celebrate in! I don't remember 26 being that fantastic honestly, one year closer to the big 3-0! LOL...sorry, no need for alarm just yet. Hope you did something nice for your birthday. Love the scallops and color of this dress! The color of that dress is gorgeous and looks great on you! Happy birthday! Sign me up for 26 if it includes tortoise accessories and pretty scallops! Happy belated birthday Jessica, I hope you had a (lowkey) blast. obsessed with the scalloped hem on this dress! Happy late birthday! I love that dress! Happy birthday!!! Happy birthday Jess! You look fabulous! The color and cut of your dress is so pretty! Love this look! That dress is adorable and I love it with the blazer! Oh 25 was a fabulous year for me! I hope it is for you too pretty lady! I'm loving that scalloped hem! And I'm always a huge fan of mint - double score!